Israel is a country of 8 million people with very little in the way of natural resources, but it has constructed a juggernaut reputation for being a global leader in technological innovation, whether it be in mobile applications, military defense systems, cyber-security, and even water sanitization and energy generation. As a result, it is difficult to separate the economic stature of Israel from its education and emphasis on innovation. This dynamic materializes in the Negev Desert in the city of Beersheba. With substantial funds, such as half a billion dollars for the cyber-security sector, flowing in annually, Beersheba has been able to build a new city that physically and metaphorically links Israel’s energy, military, education, cyber-security, and overall technological intelligence in one location. The image below shows Beersheba, a shiny new cyber-city in the middle of the Negev (Nakashima). While Beersheba serves as a shining example of Israel’s economic prowess, the economic aspects of the city differ greatly from the rest of Negev. Desert economies, due to the scarcity of resources, are relatively weak. For example, the Israeli government purposely locates its solar fields in the desert because of the sunny and hot environment; moreover, military bases are scattered throughout the region because of the cheap real-estate (Gross). In the non-city or military areas of the Negev, which are pretty much barren land and rock the crux of the economy is tourism. This can be segmented into three categories: Masada, the Dead Sea, and the Bedouin tents. People who visit Israel almost habitually go to the historic Masada stronghold and bathe in the Dead Sea. Those people have to go through the Negev, which is home to countless Bedouin settlements, to get to those places. This caters perfectly to the Bedouin’s basic reputation for being incredibly hospitable. This flow of people through the desert from Tel Aviv or Jerusalem to Masada or the Dead Sea with a pit stop at the Bedouin tents has created an economy where there otherwise would not be. At Masada there are light shows at night and at the dead sea, cosmetic products are plentiful (Tourist Israel). This really shows how people have commercialized experiences and sites. Cohen, Gili. “Israeli Army Putting up New Building in Central Israel, as Move to Negev Delayed.” Haaretz.com, 10 Jan. 2018, www.haaretz.com/israel-news/.premium-idf-putting-up-new-building-in-center-as-negev-move-delayed-1.5395807. Gross, Judah Ari, et al. “In First, US Establishes Permanent Military Base in Israel.” The Times of Israel, www.timesofisrael.com/in-first-us-establishes-permanent-military-base-in-israel/. “Masada / Dead Sea.” Tourist Israel, 5 Feb. 2018, www.touristisrael.com/masada-dead-sea/848/. Nakashima, Ellen, and William Booth. “How Israel Is Turning Part of the Negev Desert into a Cyber-City.” The Washington Post, WP Company, 14 May 2016, www.washingtonpost.com/world/national-security/how-israel-is-turning-part-of-the-negev-desert-into-a-cyber-city/2016/05/14/f44ea8e4-0d58-11e6-bfa1-4efa856caf2a_story.html?noredirect=on&utm_term=.ba25318f65b2. This investment has naturally yielded a plethora of political backlash focused on environmental issues (Seidenberg). This highlights the underlying theme here that politics in the Negev desert are inextricably linked to the environment, whether it be development or preservation. In order to fully understand the politics of the Negev, it is crucial to trace the struggle for rule that has defined its history. The nomads, such as the Bedouins, settled in the Negev as early as 5000 BC. While nomadic life still persists in this region, the land has been occupied and rule by several empires, including ancient Hebrew tribes, the Nabateans and Romans in the early centuries BC, the Byzantines in early centuries AD, the Islamic empire in the eighth century AD, and finally the Ottoman and British empires in modern times, which have given way Israeli rule. However, although the Israeli government setup developmental towns, such as Arad and Netivot, it is important to note that Jewish refugees absorbed much of the land in this region following World War II and has even become home to several bases for the Israeli Defense Forces (Finkelstein). It would be remiss to exclude a discussion of the politics at play in Israel and the adjacent countries. However, the Negev largely separates itself from such dialogue simply because there is not a great deal that happens in the desert. 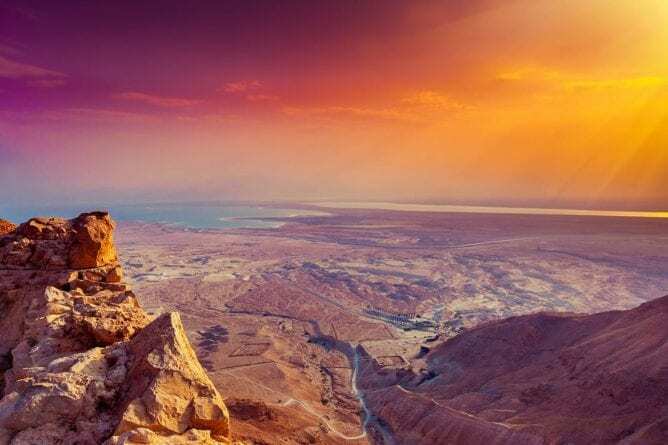 The significance of the Negev resides in its historical and biblical ties. As a result, the great debate is which people is entitled to the Negev. Because all parties believe in their individual ownership beyond any reasoning, this is a debate that is unlikely to end. What seems more likely is that the Negev stay part of the nation of Israel, but the people who reside there live without consideration of who technically controls the land in which they inhabit. “COMMUNITY BUILDING – OUR BLUEPRINT NEGEV STRATEGY.” Jewish National Fund, Jewish National Fund, www.jnf.org/menu-2/our-work/community-building/community-building—our-blueprint-negev-strategy. “JNF Logo.” Miami’s Community Newspapers, 10 Feb. 2015, communitynewspapers.com/wp-content/uploads/2015/02/jewish-national-fund.jpg. Seidenberg, David, and Shir-Yaakov Feinstein-Feit. “An Open Letter to the Jewish National Fund.” NeoHasid.org | Devorah Brous’ Open Letter to the JNF, Neohasid.org, 7 Jan. 2006. Finkelstein, Israel, and Avi Perevolotsky. “Processes of Sedentarization and Nomadization in the History of Sinai and the Negev”. Bulletin of the American Schools of Oriental Research (279): 67–88. Aug. 1990. “A View of the New Combined Military Training Bases in the Negev Desert, near Be’Er Sheva. The Vacated IDF Bases in the Central Region Will Be Earmarked for the General Housing Market.” Hamodia, 4 Jan. 2015, hamodia.com/2015/01/04/cabinet-approves-transfer-idf-bases-negev/. Spanning 4,700 square miles, the Negev Desert covers over half of Israel. The majority of the Negev is very arid, given its location east of the Sahara. Average temperatures typically range from 70 degrees Fahrenheit in the winter months to well above 100 degrees during the summer months. There is also an average rainfall of virtually zero throughout the year. These values are relatively standard of desert environments. From a landscape perspective, the Negev is a rocky desert with intermittent wadis, which are dry rivers that briefly bloom after a modicum of rain, and sand dunes. Because of the arid climate and low rainfall, the soil is very tough; thus, there is very little vegetation that can survive and flourish. 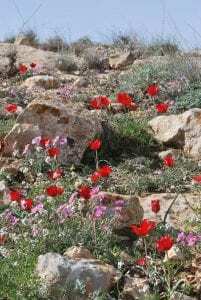 The image below is an example of what types of flora populate the Negev. Pisanty, Gideon. 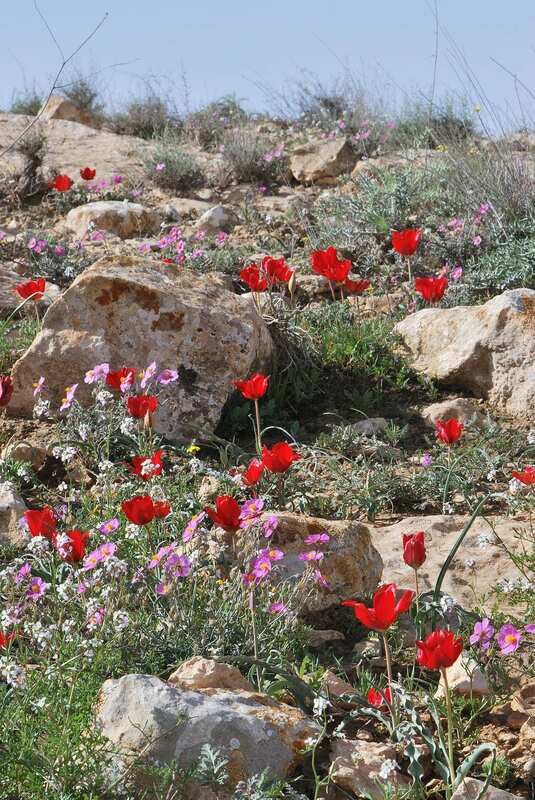 Spring Blooms in the Negev. Negev Mountains, 5 Mar. 2010. From a touristic perspective, the Negev sees a lot of action. Whether it be busing through the desert on their way to the Dead Sea or to Masada, tourists interact with the desert in a variety of ways. While this inflow of people has many benefits, mostly economic, it also can have many detriments, both from a cultural perspective as well as environmentally. 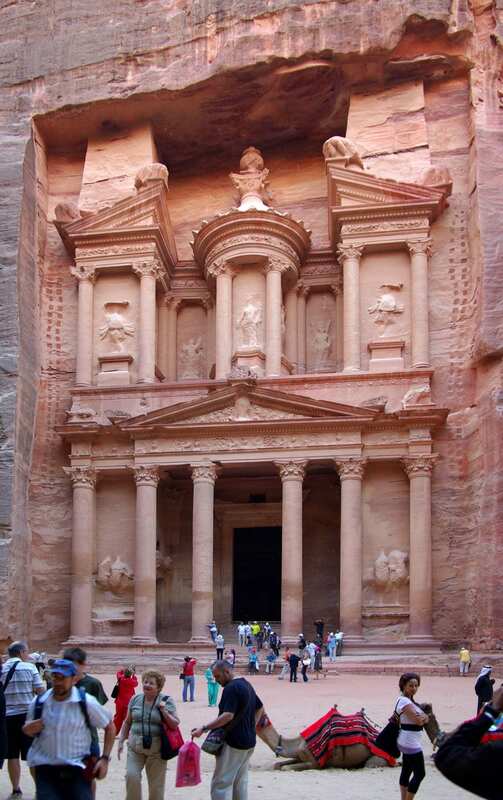 The image below shows the ancient ruin of Petra, a world-renowned tourist attraction located in the Negev. Werner, Berthold. Petra, Al Khazneh. Petra, 10 Nov. 2009. Shoup, John. 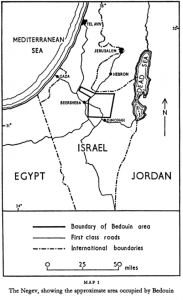 “The impact of tourism on the Bedouin of Petra.” The Middle East Journal (1985): 277-291. Ornstein, Daniel, et al. The Ecological Impacts of Homestead Settlements in the Negev: Final Report. The Israel Ministry of Environmental Protection, Jerusalem, Nov. 2009, www.sviva.gov.il/InfoServices/ReservoirInfo/DocLib4/R0201-R0300/R0288.pdf. The Negev desert is home to about 110,000 Bedouins. In central-Israel specifically, approximately 10,000 Bedouins live in settlements. Presumably unlike many other destinations picked in class, the Israeli Negev is home to countless Bedouin communities. The image below shows where exactly in Israel’s Negev Desert the Bedouins inhabit. Marx, Emanuel. Bedouin of the Negev. Manchester University Press, 1967. Being a nomadic tribe, Bedouins are not sedentary and thus do not establish officially named communities. 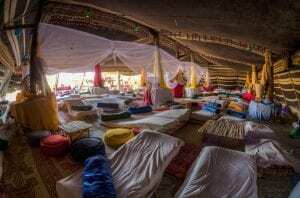 Some of the more-westernized tribes have, however, setup certifiable communities for tourism purposes, including Kfar Hanokdim, a notable center for “authentic Bedouin Hospitality” experiences. The following image shows Kfar Hanokdim and how westernized the Bedouin experience has become in this particular camp. “Negev Desert (Negev Israel) – Kfar Hanokdim.” כפר הנוקדים, www.kfarhanokdim.co.il/en/article/the-negev-desert/. The Negev Bedouin have been in a constant state of movement for several generations. Although it is their historical nature to wander, as they were traditionally nomadic herders and farmers, over the past few generations, they have been driven out by war and politics. The Negev is important to the Bedouin people because of several reasons, most notably its religious significance and its resources, not to mention the fact that it is where the Bedouin have settled for thousands of years. 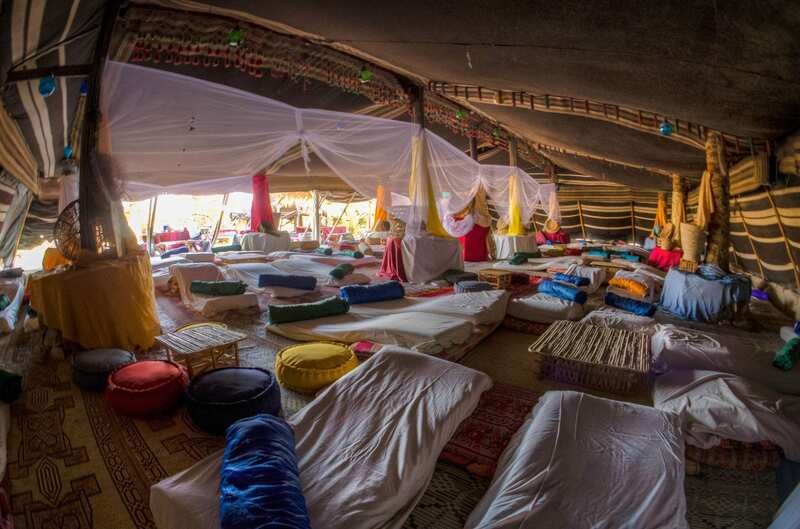 Tourism has impacted the Bedouins of Israel’s Negev in a variety of ways. There has been significant investments into infrastructure to get the tourists to the settlements as well as in the camps themselves. They have expanded considerably and even added better sleeping accommodations and daytime activities/attractions for their guests. The inflow of tourists compromises their identity as a nomadic peopleand hurts the environment around them. It also makes their settlement permanent, which opposes the very fabric of who they are. Meir, Avinoam. As nomadism ends: the Israeli Bedouin of the Negev. Westview Press, Inc., 1997. “The Bedouin in Israel: Demography”. Israel Ministry of Foreign Affairs. 1 July 1999.